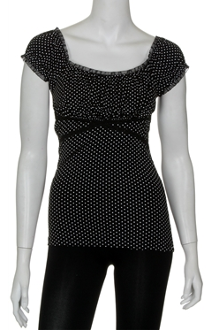 Junior cap sleeve polka dot top with cross design front and ruffle design around neckline cuffs. Made in the USA. 92% Nylon, 8% Spandex. Comes in size: XSmall.